This is a golden opportunity for Tribal Districts of North Waziristan and South Waziristan to get free technical education. With the collaboration of SRSP and UNDP, USAID funding an uplifting skill program for the residents of North and South Waziristan in the following categories. Age limit is 18 to 36 years but can be extended to 40 years in some cases. Hafiz-e-Quran Candidates will be preferred. In a special case, only 3 holidays will be allowed in a month. 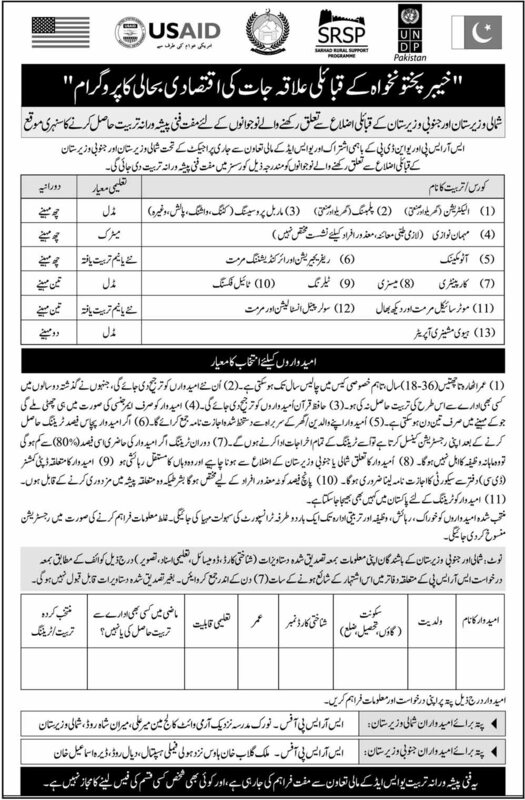 Applicants must be a resident of North or South Waziristan. 5% of quota has been reserved for disables. A candidate can be sent anywhere in Pakistan for training. Applicants will be provided with free food, accommodation, training, transport and stipend. Note: All these facilities will be provided free of cost. Applicants should submit their application forms along with attested documents in the regional office of SRSP. Address for the residents of South Waziristan: SRSP office- Malik Gulab Khan House Near Family Holi Hospital Diyal Road, D.I Khan. Address for the residents of North Waziristan: SRSP office- Norak Madrassa Near Army White College, Main Meer Ali, Meeran Shah Road, North Waziristan. For further details, an image is given below.